Burger King has not exactly lived up to its name in Japan. It has only 15 stores nationwide, compared to McDonald's roughly 3,750. But there's no denying that Burger King now offers the biggest burger in town. This month, the American fast food chain, in an oddball marketing tie-up with Microsoft, launched the Windows 7 Whopper, a 5-inch (12 cm) tower of meat stacked with seven beef patties and weighing nearly a kilogram  more if slathered with ketchup. The magnitude of meat has evidently blown the idea of a traditional lunch of fish and rice from the minds of men in their 20s and 30s, the main consumer of the new Whopper. As of Oct. 30 Burger King had sold about 10,000 in a little over a week. The first 30 burgers in every store are priced at 777 yen (about $8.55), after which the pricetag doubles to 1,450 yen (about $16). The behemoth of beef is the result of a tie-up between Lotte Group, which owns a majority stake in Burger King's Japan franchises, and Microsoft, to let non-techie consumers know that Microsoft has released a new version of its operating software. The burger's whopping success exceeded expectation, and Burger King decided to extend its campaign for another nine days until Nov. 6. Burger King spokesman Masahiro Unuma says the company is surprised by sales and the attention the Whopper has drawn, particularly on YouTube, where videos have popped up of people taking on the seven-patty challenge. Attempting to explain its popularity, Unuma offers, "It seems that the group of people who have an interest in the uniqueness of Burger King  this time with the 7-patty burger  overlaps with the group of people who have an interest in Window's 7." Maybe. But there's also the uniqueness to be found in Japan's relationship with food, and the cultural fixation on eating it or appraising it. Takeru "Tsunami" Kobayashi wasn't six-time champion of Nathan's Hot Dog eating contest without the backing of a culture that knows how to stretch their stomachs. Many celebrity "tarento" (talent) become famous by stuffing their faces, and "oogui" (or competitive eating) is so popular that TV Tokyo, a major network, has a seasonal special program to determine the "King of Gluttons." This September, "food fighter" Ayari Sato won against seven competitors through three rounds of gorging. To spice it up, they weren't told what they would be eating until the round began. And tarento Gyaru Sone, or Natsuko "Gal" Sone, is a petite competitive eater and singer who appears regularly on shows, on which she might down enormous quantities of Japanese curry and rice or 40,000 calories by eating at several restaurants during the course of a program. 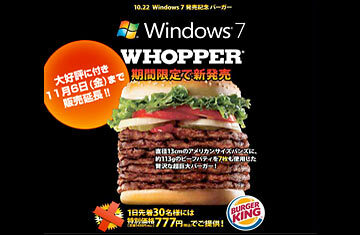 Compared to the quantities consumed by oogui champs, the Windows 7 Whopper is a light snack. But it's just the kind of product that Burger King needs to nibble at McDonald's 75% share of the fast food burger market in Japan. After being squeezed entirely out of the Japan burger market in 2001, Burger King returned to Tokyo in June 2007 with a more regional menu, including a teriyaki Whopper. And this summer, Burger King launched the Angry Whopper, with a campaign that encouraged people to shout their frustrations at full volume to win a year's worth of Whoppers. Had they kept that campaign running until now, McDonald's Japan execs might number among the winners.